When it comes to Halloween, many people opt for wigs, but those of us with curly hair are blessed with a lot to work with to get into character. If you normally wear your hair in its natural state, straightening it can cause a dramatic effect, and the cool October weather will keep hair smooth. An even more fun option for those with curly hair is to tease it up and maximize its volume potential. Hairspray, backcombing and boosting with a blow dryer can help you mimic the look of your favorite character or create your own unique persona. Last October, I decided to avoid the itchy Cleopatra wig and teased my hair up and turned myself into a lion instead. Rather than fighting my hair and trying to conceal or squeeze it into a wig, I turned it into the “mane” focus of my costume. The hair, makeup and outfit were so easy to put together, and it would even be a great idea for a curly haired child’s Halloween costume. Start with unwashed hair. I combed out my hair first with a wide tooth comb, making it less curly and more fluffy. Put a golf ball size amount of mousse through it and scrunch it in. Blow dry your hair upside down while combing the underside to create volume, then backcomb the hair under the roots. Make sure you don't create too many tangles to have to comb through later. Use Loreal Elnett hairspray (Deva Curl Flexible-Hold Hairspray would be a good natural alternative) to add texture and hold, as well as lift your roots. If your hair is fine, dry shampoo or baby powder will add volume. Continued to lift, tease and scrunch your hair to your desired lioness look, finishing it off with a final healthy dose of hairspray. And that is how you create a mane! 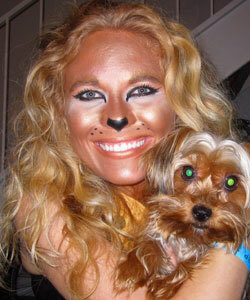 If you would like to recreate the makeup look as well, be prepared to use a good portion of your bronzer! I already had my normal daytime makeup on (foundation, powder, blush, mascara), and I began to layer on two different bronzers. One was darker and matte, while the other was lighter and had a shimmer to it. If you are going to a party that will have dim lighting, it is best to use some shimmer to highlight your face. I worked the bronzer into my hairline, allowing it to go into my hair for added texture. I darkened my eyebrows with a dark brown eye pencil and set them with brown powder eye shadow. I then used light concealer and white powder around my eyes to create contrast with the black lines I was about to add. I began with a typical cat-eye, first using a black pencil as a guide and retracing with liquid liner, curving the outer portion of the line upward. I then extended it in a downward motion on the inner corner of my eye. This can be made as dramatic as desired. I traced my lower lash line with a thick line of liquid liner and used a black pencil on my waterline for depth. I finished off my eyes with multiple shades of brown eye shadow and retraced the lines with Tarte Amazonian Clay brown eyeliner. Next, I added the nose and whiskers. I drew the nose on in an upside down triangle shape with black liquid liner and filled it in with a black pencil. I only made three dots on each side for whiskers, but lines could easily be added. I used peach lipstick and topped it off with the shimmery bronzer that I had used on my face. Unlike most Halloween costumes, the clothing was actually the easiest part. I wore black leggings, wrapped brown and orange fabric around me and attached a tail at the back with a safety pin. This part of the costume can easily be created by making use of what you already own and would be fairly simple for a child. This was such a fun and simple curly haired Halloween costume, and I hope you enjoy making it your own! Do you have a favorite curly costume idea?